Continue reading Where did my traffic go? Permalink: Where did my traffic go? Sometimes I find myself really bothered by 3rd parties who claim to have Google Analytics integrations not take the care to make sure that is done correctly. Indeed, one of those companies is DudaMobile. The strange thing about the DudaMobile situation is that they have some sort of official partnership with Google Analytics. Indeed, when you search for Google Analytics and DudaMobile, there are lots of articles about this relationship out there. I didn’t take much time to read into exactly how this partnership works, but my understanding is that it is different from the actual DudaMobile product. Ever since returning from Superweek in beautiful Galyateto, Hungary, I’ve been thinking a lot about data and the utility of Google Analytics as a tool. Yes, I know, I spend a lot of time thinking about those things, but the conference was particularly inspiring in those regards. Google Analytics is not different than any other digital analytics tool insomuch as it is critical to understand what the values that get reported actually mean and how they get there in the first place. But that’s not enough. When we analyze data, we need it to be presented in a meaningful way. Data visualization is tremendously important in this regards, and I believe that one of the reasons why Google Analytics has such great adoption and market penetration (besides the enticing $0.00 entry price point) is because the UI is crisp, FAST, and easy to use. I’ve been working on implementations with a number of clients who have a need for visitor level tracking in Google Analytics so that they can start using GA to measure things like customer loyalty and (try to) calculate Lifetime Customer Value. I understand that there are a number of data models available to approach these sorts of questions, and that either Custom Variables or Events can be used (using either visitor level vars, or session level vars populated from server-side values). In general, I like pushing the _utma cookie value back into Google Analytics, as it uncovers every single visit in the API. There are lots of benefits to doing this. Justin Cutroni wrote a nice post about merging GA data with a data warehouse. This is just one (powerful) thing that can be done using this method. What interests me in this post is “how unique are ‘unique’ visitors?” We all know that a unique visitor is nothing more than the value of the _utma cookie’s unique ID. I don’t know about you, but I certainly access websites from multiple browsers from multiple computers. I don’t find it unreasonable for a “person” to indeed have 6 or 7 unique “visitor” values. Start adding in users who clear their cookies and/or Private Browsing and the meaning of “uniques” really begins to degrade. Luckily, I have access to data where, in addition to capturing _utma values, we’re also capturing obfuscated member ID values. These values are set as a custom variable upon login. This means that a user will maintain their ID whether or not they switch browsers or clear cookies. Here are some of the numbers that I pulled. Number of Unique Members is 61% of "Unique Visitors"
The data set that is decently large and no data sampling has been applied to these numbers. At first glance, it appears that the number of unique logins is 61% of the number of GA’s unique visitors. 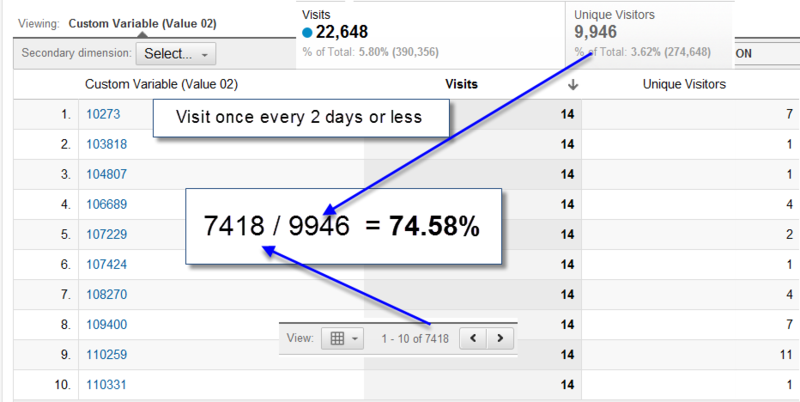 Two things that stuck out at me were the number of visits in a 28 day period by some of the most active users. The top ten most active users average 11.68 visits per day. Also, line 7 had a large ratio of unique visitors to visits. Was this one user who cleared cookies often? Was this shared login information? In order to make sure that this made sense among users who visited the site less often, I filtered by logins that had less than 3 visits per day, 2 visits per day, and visits once every 2 days. The numbers were pretty consistent for members who came 3 times a day or less, though users who visited once every 2 days or less saw a higher percentage of unique visitors to login IDs. 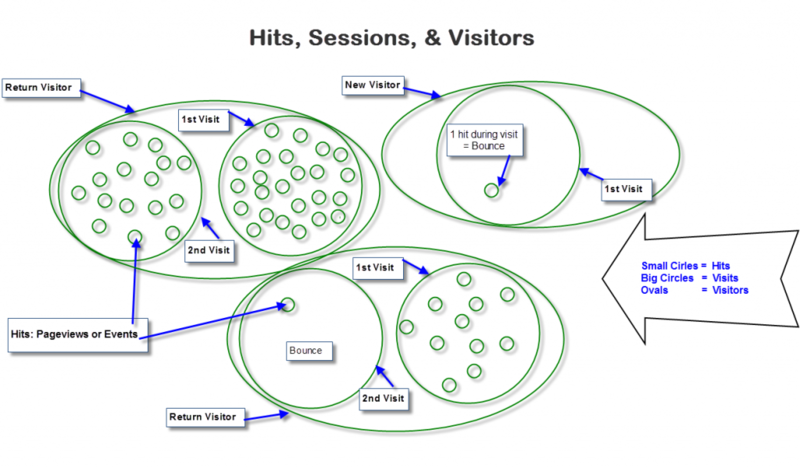 The “unique visitor” metric was never meant to describe the number of “unique people” that visited a site. Admittedly, this terminology can be confusing for the average person. While web analysts have known that ‘unique visitors’ refers to a count of unique cookie values in the browser, I find it quite nice to be able to quantify this in numbers. Indeed, from the data above, it appears that the number of unique visitors reported is somewhere between 25% – 39% greater than the number of people who visit a site. If you have any additional data, please feel free to share below. 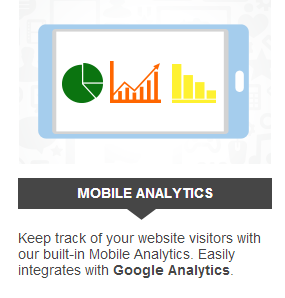 Multi-Touch Attribution with Google Analytics. It is well known that Google Analytics relies on last touch campaign attribution. In short, this means that conversions and transactions are attributed to the most current traffic source of the visit (i.e. the ‘last touch’). It goes without saying, but you should read Avinash Kaushik’s Web Analytics 2.0 (attribution models are discussed chapter 12) if you haven’t done so already. It’s a great intro to the issue at hand. Additionally, there has been lots written about this already, with a number of different solutions given for how to overcome the limitation in Google Analytics. After many hours of scouring the web, I must admit that I didn’t find a solution that adequately met my needs for Google Analytics. To be fair, I just came across http://www.multitouchanalytics.com/ which uses it’s OWN cookie to pass data into GA using event tracking (use a 2nd tracker so you don’t skew your bounce rate). I’m interested in trying it out. I especially like how YourAmigo has a number of out of the box reports that automate a number of attribution models. Very cool. Also, what we’re about to see here isn’t really an attribution model. The *value* assigned to the first touch, middle touches, and last touch aren’t addressed here. 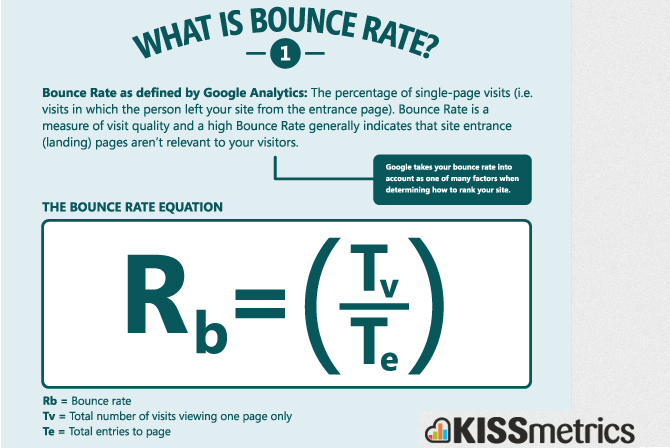 What this post does address is the lack of visitor level data in GA. Using the method below, you’ll be able to IDENTIFY all of the touches that bring visitors back to you site. So while branded keywords may indeed be the best converters on your site, wouldn’t it be nice to know how many of those visitors first visited your site after clicking on a PPC ad? In any case, here’s how I push VISITOR level data back into GA (which of course can and should then be sliced and diced via advanced segments and custom reports – yummm!!!). The UTMA cookie is central to a TON of the reporting in Google Analytics. Visitor Loyalty, Visitor Recency, Days to Purchases, Visits to purchase, etc etc… all of these metrics rely on this visitor level cookie. 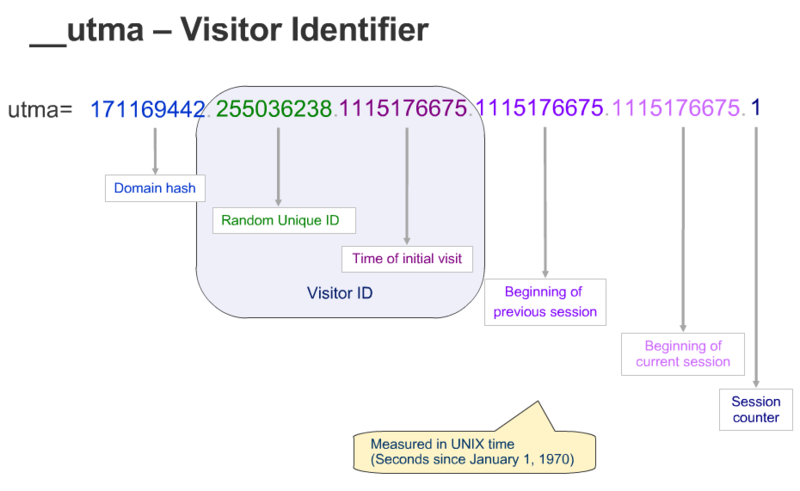 As can be seen in the image above, every visitor who comes to your site is assigned with a random unique ID. Continue reading Multi-Touch Attribution with Google Analytics. Permalink: Multi-Touch Attribution with Google Analytics. 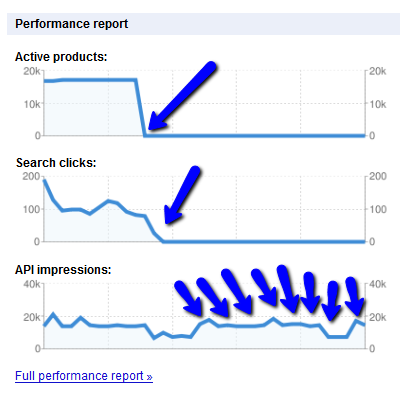 I recently discovered a discrepancy between the way that a client’s Google Merchant Center account was performing on Google Product Search and Google Product Ads. When I first set up Google Product Ads, I had assumed (oops!) that I would see the Adwords campaign in Google Analytics like the rest of my auto-tagged campaigns, complete with click and cost data applied. I was wrong. Nothing there. (For now, cost data for Product Ads is being shown exclusively in Adwords, not in GA). So I thought I wasn’t getting any clicks on the campaign, as I tend to look at Google Analytics first and only later delve into the Adwords interface for additional data I might need. What I did notice in my GA account was that my Google Merchant Center Feed (which I tagged as Googlebase), took a big hit in traffic recently. My feed was DISAPPROVED, but I was still getting impressions. Huh? When looking at my individual product performance, what Google told me was that my feed was good enough for Adwords Product Ads, but NOT good enough to keep sending me free traffic. While I’m not showing the product names in this next image to honor my client’s privacy, note that each line in this chart represents an individual product. 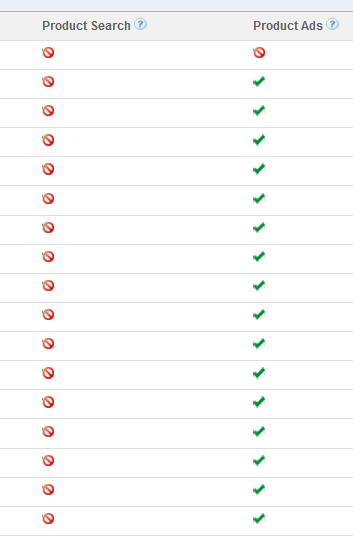 WOW – a lot of checks for Product Ads (paid), but the free clicks are all offline. I guess that quality of this product feed is good enough to make Google money, but (recently) not quite quality enough to include in their product listings. I recently had the pleasure of speaking at SphinnCon 2011. I’m sure that anyone there would agree that this year’s conference was really great. Big thanks to Barry Schwartz for putting it together. Below is a copy of my presentation together with a screencast I put together for anyone who couldn’t make it (or would like to review). 🙂 Enjoy!